Posted January30, 2011 Disclaimer The information presented here is for informative and educational purposes only and is not intended as curative or prescriptive advice. 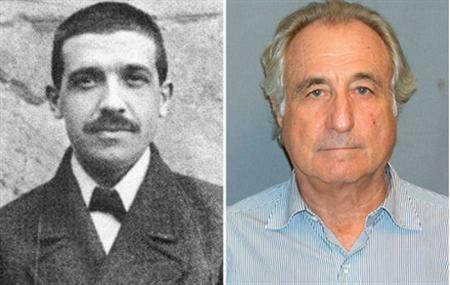 The term Ponzi scheme is named, not after the lighthearted "Happy Days" characters Fonzie Fonzarelli and Potsie Weber, but rather, after the real life swindler Charles Ponzi, who developed an ingenious investment scam approximately a century ago. His fraudulent operation flourished by rewarding early shareholders with phenomenal returns. He was able to do this by luring in a steady supply of new investors, who thought that they were investing in a legitimate wealth generating enterprise, but were actually just paying off earlier stakeholders. Unbeknownst to the newcomers, they were investing in nothing of value, but were relying solely on the continuation of the scheme, and the luring in of new investors, to get their money back. Based on the laws of mathematics, the operation could only continue for a finite period of time before the required supply of "suckers" ran out. In general, the only "winners" in a Ponzi scheme are the organizers of the enterprise (before they get caught) and those who withdraw their investments before it implodes. The most spectacular recent example of a modern Ponzi scheme was Bernie Madoff's infamous wealth management fund which went belly up in 2008, after operating for more than two decades. When Madoff was finally arrested in December 2008, investors, who thought they had 50 billion dollars invested in the fund, were shocked to discover that their "investment" was backed by absolutely nothing, and had a value of precisely zero. Madoff and early participants in the operation became fabulously wealthy before the house of cards collapsed. Rand would argue that our modern monetary system has, in the past generation, turned into a gigantic Ponzi scheme. New investors are investing in securities that have little chance of being fully repaid unless the fraud continues. It is important to note a fundamental thesis of this blog,	Rand: Money system is Ponzi which seems to have been ignored by modern regulators: In a debt-based monetary system, money is only as valuable as the collateral backing the debt. Unfortunately, most of the new net borrowing in our country is backed by no collateral at all, but simply the "full faith and credit" of the United States Government. Repayment will only occur only as long as the Ponzi operation continues. As evidenced by the graphs in Rand's previous few posts, for the past three decades in the United States, the growth rate of our debt has far outstripped the growth rate of our GDP. In 1980, for example, the ratio of debt to GDP in the United States was roughly 160%. At the present time, the ratio stands at more than 350% (the United States now has approximately 52 trillion dollars of debt and only 14 trillion dollars of GDP.) Unfortunately our debt, or money, is simply not backed by enough "stuff." Each new iteration of debt has been issued on shakier and shakier ground. In the past year or so, most of the new net borrowing has been by the U.S. Government itself. Rand argues that this debt is "pure Ponzi debt." There appears to be an increasing probability that it can never be repaid, without the continued perpetuation of the scheme. U.S. Treasury debt is being sold to investors, not based on any potential wealth generating capabilities of our government, but rather solely on the "good reputation" of the United States itself. We are in the final stages of a Ponzi bubble. New loans are being issued backed by faith and reputation, rather than things of real value. These loans are just creating the money necessary to pay off earlier creditors and keep the system running for yet another day. The only "winners" in this game are the Ponzi operators (the bankers in our current system) and those who exit the system before the inevitable collapse. "Unhappy Days," indeed, lie ahead for all of us caught up in this gigantic Ponzi.